The BJP has cited observations made in the Comptroller and Auditor General’s (CAG’s) report for the year ended March 2003 to reiterate that the Sheila Dikshit Ministry has defrauded the tax payer of Rs 10 thousand odd crore in the unbundling of the (erstwhile) Delhi Vidyut Board and it ought to be dismissed. Protesting lawyers, including Delhi Bar Association President Rajiv Khosla, were detained today for locking up the gates of Tis Hazari District Courts here this morning. The Delhi High Court today directed the Directorate of Education to ensure admissions for those students from economically weaker sections who have been denied admission in schools run by the government. An adolescent needs to be immunised against disease as much as an infant. With students showing scant regard for the moral code of conduct, which was unveiled last year by the Delhi University for the elections to the students union, the authorities are now banking on the law enforcement department to achieve the desired results. A robber killed a woman by slitting her throat in a posh area near Nandgram police post under Kotwali police station. The woman had reportedly resisted his attempt to rob her. With the arrest of two desperate criminals, including the ex-president of Minority Cell of a political party, the South district police claimed to have solved a sensational dacoity which took place on June 28, 2004 in Saket. The police also claimed to have recovered one country-made weapon, one live cartridge, one Tata Safari and Rs 4 lakh from their possession. Traffic snarls were the news this morning as the city grappled with waterlogged roads and serpentine queues. The Citizen Welfare Association has asked the Maharishi Dayanand University authorities to check the alleged irregularities in the elections of the governing body of the G.G.S.D College at Palwal town in the district. It has demanded to scrap the alleged practice of allowing the nominated members to participate in the election process. The governing body elections of the college, the only co-education college of Palwal, are due to held in near future. The residents of colonies near Ghazipur are protesting against the move of the Delhi Government to set up a slaughterhouse in the area. The Anti-Corruption Branch has arrested a House Tax Inspector of MCD on charges of demanding and accepting an illegal gratification of Rs 17,275. Based on a complaint from one Rakesh Thakral, the officials caught R K Singh, while he was taking the bribe. Leader of Opposition Jagdish Mukhi has now appended to his party’s oft-repeated demand that the chairman of Public Accounts Committee (PAC) of Delhi Legislative Assembly should be appointed from the major Opposition party in the House. The chairman today is a member of the Treasury Benches. Mr Mukhi said the CAG’s report also “exposed Mrs Sheila Dikshit’s claims of running Government of NCT of Delhi in an efficient manner”. The NCT of Delhi, he claimed, was caught in a debt trap as the government has more than Rs 16 thousand crore as outstanding loans and it is bound to take further loans to pay the interest on the outstanding loans. A former finance minister himself, Mr Mukhi told media persons that against the total savings of Rs 584.71 crore in grants for the year, Rs 222.99 crore was surrendered on the last day of the financial year and the remaining Rs 361.72 crore was not surrendered at all thereby depriving the government of using this fund elsewhere. Mr Mukhi cited certain other observations by the CAG to buttress his argument : Owing to a steady decline in the number of tours conducted, the tourism division of DTTDC suffered a loss of Rs 1.29 crore in the five years ending 2002-03 despite receiving grant of Rs 1.16 crore from the Government of NCT of Delhi, the CAG audit found. The CAG says the Delhi Jal Board (DJB) incurred “extra” expenditure of Rs 17.46 crore due to delay in processing of proposals and award of works. Furthermore, an “avoidable” expenditure of Rs 10 crore was incurred due to execution of works at higher rates which, in turn, allowed undue benefit to contractors. The Government of NCT of Delhi is shown in poor light also on account of the remark contained in the CAG’s report, which reads, poor utilisation of available departmental resources resulted in “avoidable” expenditure of Rs 1.58 crore on execution of de-silting and cleaning works through contractors. The Leader of the House in the MCD, Mr Satbir Singh, today issued explanation call letters to three Congress corporators on the charge of misbehaving with the Mayor and creating indiscipline in the corporation. He said that Ramesh Pandit, who represented Preet Vihar segment of the corporation, misbehaved with the Mayor when the latter adjourned the meeting of the House after approving a preamble for construction of a modern slaughter house in Ghazipur. When the meeting was resolved he stepped up the dais and allegedly tried to prevent the Mayor, the first citizen of Delhi Satbir Sigh said. He said that Mayor had given a written complaint against Ramesh Pandit. The other two corporators are Prem Kumar and Sanjaypuri. While Prem Kumar continued speaking in the House despite being asked to sit down, Sanjay Puri, it was alleged, passed on information to the media even before the issues were tabled in the standing committee. While the exact number of detainees was not confirmed, it was pointed out that the police had picked up all the office-bearers of DBA. The advocates in the biggest district court in the country are opposing the shifting of 12 courts to the newly built court complex in Rohini in West Delhi. The association officials have claimed that the Delhi High Court had ordered the shifting of the courts to the new complex without providing the necessary amenities. The New Delhi Bar Association at the Patiala House District Court has also joined the strike in solidarity with the Delhi Bar Association. In the morning, a delegation of the association met Delhi High Court Chief Justice B. C. Patel and made a representation, urging him to intervene in the matter. The Chief Justice said it was unfortunate that after the District Judge yesterday informed the Delhi Bar Association President that no decision has been taken by the High Court on shifting of courts to Rohini, the Tis Hazari lawyers had gone on strike. The Chief Justice held a chamber meeting with Delhi High Court Bar Association President A. S. Chandiyok and other bar members. He decided to hold a full court meeting later in the day to take further decision on the matter. The advocates have been detained in Roop Nagar, Timarpur and Sabzi Mandi police stations, the police said. The police has made elaborate arrangement to maintain law and order in Tis Hazari and Patiala House. In Tis Hazari, no litigant or public was allowed to enter the court complex. Even the bail and other pressing matters were not taken up till lunch hours. Security officials went into a tizzy after a call was received that a bomb had been planted in the Delhi High Court premises today. However, the call later turned out to be a hoax. The police said that a person identifying himself as Gautam called up the Police Control Room in the afternoon and claimed that the bomb, which had been planted inside a tiffin box in the court premises, would go off any time. Immediately, the bomb disposal squads and police dogs were immediately pressed into service, but nothing suspicious was found after several hours of searching. Disposing a PIL filed by the Kislay, an NGO, filed through Ramendra Kumar, secretary, Basti Vikas Kendra, Sant Ravi Das Camp, Vikas Puri, the court directed the Deputy Director of Education (West - B) to direct the concerned authorities to admit the students who were denied admission. It was alleged in the PIL that the principal of Government Co-Education Middle School, New JJ Resettlement Colony, Hastsal, near Shiv Vihar, had turned down the applications of 26 children of New JJ Resettlement Colony, seeking admission to different classes ranging from class VI to class IX in the school. The PIL filed by Social Jurists put forth that the New JJ Resettlement Colony, Hastsal, has no provision for schooling as there are no government schools in this resettlement colony, which houses more than 4,000 families of jhuggi dwellers relocated there. Kislay informed the court that in the absence of any government school in the resettlement colony the children bore the brunt. It was also put forth that many parents who managed to obtain transfer certificates of their children from the MCD/government schools, where they were previously studying, could not continue to send their children to government schools as some of them are far away while others had no option but to send their children to an unrecognised school near the resettlement colony. The PIL alleged that the principal of the above mentioned school continued to deny admission to these children on one pretext or another. The petitioner submitted that these children belonged to very poor families and in several cases their parents are unemployed. 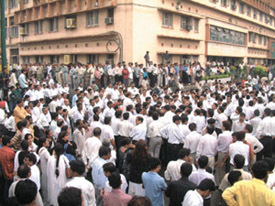 It was also pointed out that on August 3, 2004, when the petitioners last approached the principal of the school and the Director of Education, they were told that their request could not be considered because the last date of admission was 31st July, 2004, and the date had already expired. The court has now directed the concerned students to meet the Deputy Director of their zone on Friday August 13 to pursue the matter. However, even the well-bred in cities are not aware about preventive aspects of healthcare in this crucial age group. Evaluation should be done by a child health expert as a regular part of pre-matriculation assessment for MMR (mumps, measles and rubella) and Td (tetanus and diphtheria). Besides this, Hepatitis B and meningococcal vaccinations are also recommended. In endemic zones like India, Hepatitis A and typhoid vaccines should also be given. More importantly, adolescents themselves, besides their parents and teachers, should be made aware of this preventive aspect of healthcare. He explains that less than two years back, adolescent health was neither under the purview of pediatricians nor doctors treating adult patients. As a result, the immunisation needs of teenagers have remained ignored. After the intervention of the Government of India, adolescent health came under the purview of pediatricians. Though the preventive aspect of health is gaining momentum, the awareness level regarding it is still very low. “You ask any adolescent when he was last immunised, he will not know. Ask his parents and teachers. They are also not aware that this crucial age group between 12 and 19 years requires attention as far as immunisation aspect is concerned,” adds Dr Agarwal. The American Academy of Pediatrics’ Red Book on Immunisation clearly suggests an evaluation of adolescents’ immunisation status and recommends a catch-up schedule. Elaborating, he explains that an 18-year-old, who was vaccinated at the age of one, today has almost zero immunity against most of the diseases for which he was immunised. “In any case, 15 or 20 years back most of the immunisation schedules were not completed. A child receives MMR vaccine when he is between one and one-and-a-half-year old. At the age of 18, the immunity to mumps and rubella is practically negligible. But the reproductive life starts at this age. A rubella infection can strike a pregnant woman and severely affect her foetus and an attack of mumps can lead to orchitis, causing infertility in males. The code of conduct calls for a ban on the use of posters and loudspeakers and the enlisting of outsiders’ help for campaigning on the campus. The code also places a ceiling on spending at Rs. 10,000 and restricts the use of cars for campaigning among other things. However, owing to lack of enforcement, the offenders go scot-free. “We cannot do anything about the offenders. Unless we have a provision to penalise the students, we cannot check the problem. We say that use of posters is banned, that candidates should not spend more than Rs. 10,000, but these guidelines are not followed in letter and spirit”, rued Khanna. The concern of senior party leaders, which often translates into tangibles like posters, stickers and pamphlets, not to omit mouth-watering refreshments given during electioneering, is also becoming a bane for the authorities. “The party bigwigs should ensure that these elections help groom leaders at the grass-root level. They should educate the students, but their influence on the polls should be negligible”, he adds. Interference by the party higher ups is often a cause of concern amongst the various factions. “We have to fight against the ideology of the party. And since most of these factions are influenced by the party, we end up fighting the BJP and the Congress, not the ABVP and the NSUI”, said a party worker. While Principals have been asked to “prevent their colleges from unleashing poster wars”, the election office is working out the details with the Delhi Police to save the city from the onslaught. “The university will release the code of conduct, but we will also seek help from the enforcement agencies,” said Khanna. In the commotion following the loot and murder, people of the colony overpowered the criminal, beat him up and handed him over to the police. The incident happened near the police station, which is barely 50 metres from the victim’s house. The victim, Sudhakaran, an accountant in JC Steel in local iron market, was alone at home during the time of the incident. At about 10 am, the criminal, who paints houses, came to their flat and told Usha that her husband, Sudhakaran, had sent him for painting the house. As she went to confirm it from her husband on phone, the intruder walked into the bedroom and taken out a dagger and snatched her necklace, ring and bracelet. When he wanted to take away other valuables, Usha raised the alarm, at which the criminal slit her throat and fled away. Two neighbourhood women found the criminal rushing down the stairs with blood-dripping dagger in his hand. They ran back in terror, shrieking all the way. A number of people rushed towards the house on hearing their shrieks. Somehow people had overpowered him and gave him a sound thrashing. Later, he was handed over to the police. Usha was rushed to a hospital where she was declared brought dead. The criminal has been identified as Pappu, alias Raheesuddin, of Tekwada Mohalla in Muradnagar, who had painted Sudhakaran’s house seven years ago, the police said. Mrs Usha Sudhakaran knew him and that is how he gained entry into their flat, the police added. Noida: The Noida police were able to arrest Khem Chand, one of the four accused who had shot dead Rajiv Tyagi, 22-year-old son of Principal Jaswant Tyagi of Gandhi Smarak School yesterday. One of the revolvers used in the shootout on school premises on Sunday has been seized by the police. 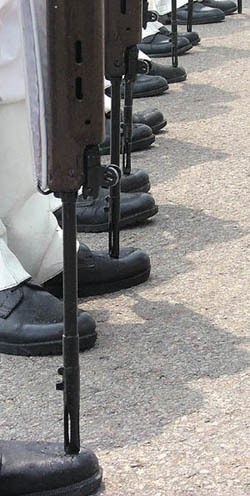 Action under the National Security Act will be taken against the accused, the police said. However, Khem Chand said in Sector-24 police station that he was not at all involved in the murder. SP Noida Anant Dev said that Khem Chand, one of the accused, had been arrested from Morna petrol pump for murdering Rajeev Tyagi and wounding his father Jaswant Tyagi, Principal of the school. His licensed revolver has also been confiscated, the SP City said. According to Anant Dev, Hemander Jat, a former companion of Principal Jaswant Tyagi had called two contract killers. Hemander who had been removed by the Principal for allegedly preparing fake documents, wanted to get even with Jaswant Tyagi. Khem Chand, however, reiterated that he was not involved in the murder. Two criminals looted Rs 70,000 from a factory cashier in Sector-10 here in a broad daylight. The cashier was stabbed with knife when he tried to resist. He was rushed to Metro Hospital in Sector-12. In C-450, Sector-10, cashier Ashok Kumar Mishra was disbursing salary to the employees when two persons barged into the premises and snatched Rs 70,000 from Ashok Kumar. When he tried to resist, the intruders stabbed him. However, SP City Anant Dev said it was a matter of give and take. Some employees who had been dismissed from the service had come to recover their dues. Both former employees had come to the factory many times, but their salaries and dues were not paid. As a result, the sacked employees had come to blows and decamped with Rs 70,000 after stabbing the cashier, the SP City said. The accused have been identified as Deepak (22), resident of Humayanpur and Yaad Elahi (29), resident of Meerut. They robbed Rs 4.67 lakh after stabbing a CMS Securities employee at Press Enclave Road on June 28 at around 1 pm. The victim used to collect cash from different outlets like Adidas, Nirulas, McDonalds from Saket on behalf of the CMS Securities. During investigations, the police nabbed four persons the next day and recovered Rs 60,000, a Santro car and a motorcycle. Since Deepak and Mithoo had escaped with the booty, the police launched a massive hunt to trace them. In fact the duo were helped by one Titu, resident of Mehrauli to stay in the house of Yaad Elahi, resident of Meerut. Elahi had been a member of land mafia and also the president of Minority Cell of a party during 1994-98. The Crime Branch claimed to have arrested two accomplices of Jitender, alias Kalla who escaped from a hospital recently. His associates Anita, alias Annu, and Vijay, residents of Mangolpuri, had helped Jitender escape from AIIMS after offering sedative-laced cold drinks to the security guards. Later, Jitender was rearrested. The sleuths also claimed to have seized a sophisticated mouser, two live cartridges and drugs from their possession. With the arrest of two persons, the South district police today claimed to have solved two dacoity cases which took place in Sunlight Colony and Mansarovar Park. The police also recovered some cash and a mobile phone. The accused have been identified as Ajhar, alias Raja, alias Thakur (23), resident of Gokulpuri and Nasir Siddique (28), resident of Khari Baoli. On August 3, the accused robbed Rs 3.44 lakh from “Gulf Associates,” in Kalindi Colony and on July 21, they robbed Rs 52,000, three mobile phones and four gold chains at gun-point in Mansarovar Park. With the monsoon unleashing its fury in the north west region, the Capital and other parts of the region were lashed by heavy rain this morning. The Met Department had recorded 1.9 mm rain till 5.30 p.m. The IMD officials said heavy downpour was expected in the city in the next 24 to 48 hours. The weather is likely to remain generally cloudy with thundershowers in some places. Heavy rainfall has also been reported from Haryana, East Rajasthan and western Uttar Pradesh. Besides, the monsoon continued to be active in Orissa, Chhattisgarh, Gujarat, Maharashtra and Madhya Pradesh. The association, on whose complaint the university authorities had quashed the elections held on May 6 last, appealed to the authorities concerned to ensure that proper process should be adopted in the elections. The president of the association, Mr Trilok Chand Gupta, in a statement here today claimed that the constitution of the college appeared vague and controversial as the college authorities allow the nominated members to caste their vote in these elections, which otherwise was unjustified. They have pointed out that the atmosphere in the area as well as in a number of colonies in Ghaziabad would be polluted with meat, hides and blood of animals to be slaughtered in the proposed slaughterhouse. A large number of people held up traffic on the NH-24 near Khera Colony for over two hours yesterday in protest against the proposed construction of slaughterhouse in Ghazipur on the Delhi border. Later, a memorandum addressed to the Delhi Chief Minister was handed over to the SDM, East Delhi, Mr V. P. Singh, on behalf of a number of organizations. The atmosphere in large number of colonies of Ghaziabad will be polluted with meat, hides and blood of animals to be slaughtered in the proposed slaughterhouse, said Chaudhuri Satypal, a resident of the area. He said the Central Government should critically examine this issue, as it is likely to affect the safe operations of Indian Air Force aircraft at the Hindon base in the area. He said lakhs of people in Khora Colony, Vijay Nagar, Indirapuram, Vaishali and colonies in trans-Hindon area could become victims of various diseases and aliments as a result of this slaughterhouse. It has been decided that the workers of different parties and organizations will start an awareness campaign to acquaint the people of the danger and risk from the proposed slaughterhouse. Speakers warned that a massive agitation will be launched if the proposal is not dropped by the Delhi Government within a week. Mr Badhel of the Samajwadi Party threatened to disrupt the water flowing into Delhi from Murad Nagar by cutting the pipeline if the proposed construction of the slaughterhouse is not shelved. President of United Federation of Vaishali Residents Welfare, Mr Nand Lal Sharma and S.L. Chaturvedi of Nagrik Vikas Samiti accused the Delhi Government and the Municipal Corporation of pursuing “dictatorial and autocratic polices”. They said it would become difficult for the residents, especially the women, children and the aged to come out of the houses.